1. Purpose: The Secretary of Defense Medal for the Defense of Freedom (DFM) is established to acknowledge civilian employees of the Department of Defense (DoD) who are killed or wounded in the line of duty. The medal symbolizes the extraordinary fidelity and essential service of the Department’s civilian workforce who are an integral part of DoD and who contribute to the preservation of national security. 2. Description: The Army’s Institute of Heraldry developed the medal. The eagle and shield exemplify the principles of freedom and the defense of these freedoms on which our country is founded. The laurel is emblematic of honor and high achievement. Red, white, and blue are our National colors. The red stripes commemorate valor and sacrifice. The wide blue stripe represents strength. The white stripes symbolize liberty as represented in our national flag. The number of red stripes represents the four terrorist attacks using hijacked airplanes, and the single blue stripe represents the terrorist attack on the pentagon on September 11, 2001. This day, more than ever, united this country and brought to the forefront our heroic civilians. 3. Certificate: A DA Form 7499 will accompany the medal. 4. Eligibility: The medal shall be awarded to any DoD civilian employee meeting the definition of “employee” under title 5 United States Code, Section 2105, and who is eligible for an award under DoD 1400.25-M, Subchapter 451, “Awards,” including employees of non-appropriated fund activities, when killed or wounded by hostile action while serving under any competent authority of the Department under conditions for which a military member would be eligible for receipt of the Purple Heart. 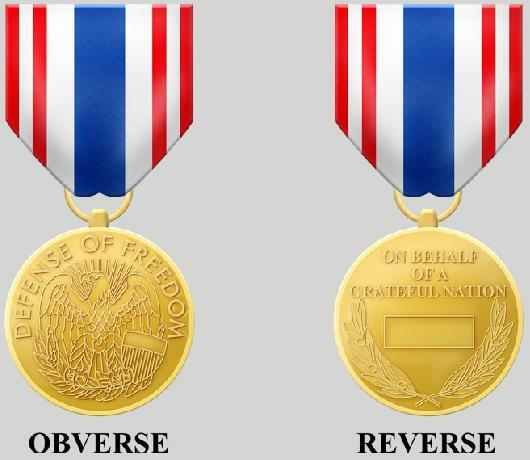 Additionally, the Secretary of Defense has discretionary authority to award this medal to non-Defense personnel who are otherwise qualified to be awarded the medal based on their involvement in DoD activities. 5. Criteria: Eligibility criteria for the medal are aligned as closely as possible to those for the Purple Heart for members of the Armed Forces; this medal differs from other medals in that it is not “recommended.” The employee is “entitled” to the medal if the employee is eligible under Section 4 and if the conditions or criteria in this paragraph are present. Hostile action may involve, but is not limited to, the use of conventional or nuclear weapons, chemical or biological agents, explosives, or missiles. The medal shall be awarded to employees who are killed or who sustain injury due to hostile action against the United States of America, or killed or wounded while rescuing or attempting to rescue any other employee or individual subjected to injuries sustained under such conditions. The wound for which the award is made must have required treatment by a medical officer, and records of medical treatment for wounds or injuries received in action must have been made a matter of official record. 6. Limitations on Awarding Medal: The medal is authorized for the incident of death or the first wound suffered under the conditions indicated above. The medal itself may be awarded only once; however, for subsequent events that would require the award of the medal, a device will be awarded to attach to the ribbon of the medal. 7. Posthumous Awards: The medal may be awarded posthumously and, when so awarded, may be presented to a representative of the deceased member’s family. 8. Responsibility and Approval: The approval authority for the DFM is delegated as specified in the Assistant Secretary of the Army (Manpower and Reserve Affairs) memorandum dated March 24, 2009, subject: Delegation of Authority – Secretary of Defense Medal for the Defense of Freedom. For government employees: provide name, SSN, title, series, grade, organization and location. Description of the situation causing the injury/death in detail to include the date, time, place, and scene of the incident, and official medical documentation of the employee’s injuries and treatment. The description must be well documented, including the names of witnesses and point of contact (POC) for additional medical information, if needed. 10. Army Contractor Nominations: The Secretary of Defense will consider nominations of contractor employees for this medal. Nominations for contractor employees will consist of the attached form, completed and submitted to the Executive Secretary, Army Incentive Awards Board, along with a report from a medical treatment facility or professional and a signed release to permit discussion of medical information by those who review the award nomination. Submit one copy of the memorandum and supporting justification to: ag1cpaiabsecretary@conus.army.mil. 3. Name of contractor company and name/phone number of POC. ABC, 1234 Main Street, Anytown, Virginia 22222. Mr. Harold Barnes (888) 555-4748. 4. Title of Component office for which contractor worked and name/phone number of Component POC or project manager. Headquarters, Department of the Army, IMCEN. Mr. Sam Jones (877) 555-4410. 5. Date and location of the event, which caused the death or injury. September 11, 2001; Pentagon. Mr. Joe Smith, Acting Director, Information Management Center, certifies that this employee was in a duty status on September 11, 2001. 6. Describe the circumstances of the individual’s death or injury, e.g., the event that caused the death or injury and how it occurred. Mr. Doe was working in the Pentagon, Room 1C543, when terrorists crashed a commercial aircraft into the Pentagon. He was hit on the head by falling debris from the ceiling and walls of his office. 7. For injuries only – (1) describe the nature of the injury and the treatment protocol (treated and released, number of days hospitalized); (2) identify where treatment occurred (treated at medical facility or by private doctor and provide name of facility/ physician and phone number if available); (3) describe extent of immediate care, (treated with aspirin, x-rays taken, etc. ), and (4) describe extent of continued care if considered necessary (outpatient care, physical therapy, etc.) Mr. Doe sustained blunt force trauma to his head and was admitted to Polaris Hospital Emergency Room where he was taken to the operating room and received fourteen stitches to close the wound in his head. He received medical treatment at the hospital until September 18, 2001. He had physical therapy appointments once a week for several months. 8. CERTIFICATION STATEMENT: MG Thomas Smith, Commanding General, U.S. Army XXXXXX, signed memorandum recommending approval. Can any one tell me do I qualify for this honour. I lost a big part of my hearing in KAF. And it is documented and have recieved compensation from the defence base act. sorry but you are canadian…not a US citizen….thats like giving a purple heart to an canadian sodlier..